It used to be said that the average US business mailing address (snail mail) changes once every 9 months. (That’s individuals moving, not companies.) Fast-forward to today’s highly mobile workforce, where people change jobs like the proverbial underwear, throw in a volatile economy, and more than one-third of the email addresses in your marketing database could change each and every year*. The result: more hard bounces and unsubscribes. There is one simple technique, however, that can reduce the turnover. I was reminded of this when I changed companies late last year. When I went to my favorite e-newsletters, blogs, and online periodicals to change my email address, I discovered in most cases that I had no such option. In fact, my only option was to unsubscribe, and then re-subscribe with my new address. That’s crazy. Your subscribers, customers, prospects, ANYONE that you email regularly, should have an easy, intuitive, immediately accessible means of updating his/her contact information, including email address. 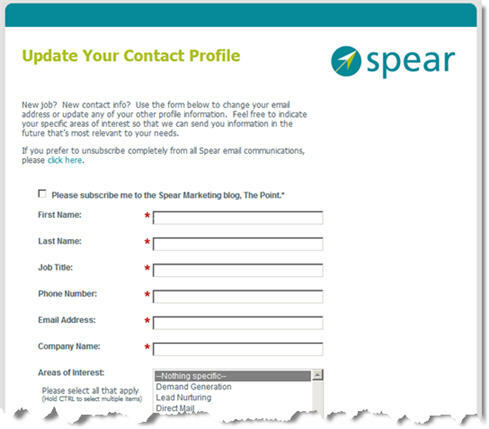 At our agency, when we send emails – for example, to blog subscribers – we include this “update profile” option in two locations – one immediately under the body of the email (image at right), and another in the footer immediately under the unsubscribe link. This last option is critical, because when a subscriber is changing his/her email address, the first instinct will NOT be to provide you the new and correct information, but rather simply opt-out of further communication entirely. When a subscriber clicks on our “update profile” link, he/she gets taken to a simple landing page (at right) where it’s a quick and easy task to update the relevant data. Because we host our page on Marketo, the old information is pre-populated automatically for anyone who has previously opened one of our emails. As a result, we’re not asking the individual to complete the entire form; just to update the incorrect information. Note also that we use the opportunity to do a little “progressive profiling,” that is, to learn a little more about our subscribers by asking them (optionally) to identify areas of interest. This gives us the ability, if we so choose, to send highly relevant content at a later date to subscribers who have particular areas of interest. Don’t let your hard-earned contacts disappear due to the inevitable turnover. After all, you’ve earned them! *As long ago as 2002, the Direct Marketing Association was reporting that fully 33% of people change their email address once per year. That figure has almost certainly increased in the 8 years since. Has anyone seen more recent statistics? If so, please include a link or reference in the comments. This entry was posted in B2B Marketing, E-mail, email design, email marketing, Lead Management, Lead Nurturing, Marketing Automation and tagged b2b demand generation, b2b lead generation, B2B Marketing, Demand Generation, direct marketing best practices, E-mail, e-mail marketing, email design, email marketing, lead generation, Lead Management, Lead Nurturing, Marketing Automation, marketo on April 8, 2010 by Howard Sewell. REALLY helpful insight! we’re working on it right now….